Posted on December 29, 2017 January 3, 2018 by KeithGPosted in Friday Night Fights, Model SpotlightTagged Digital Chicanery, I should have won last week, LDD, Mecha, You people have no taste. Tallneck is badass, but Punisher and its low profile gets my vote on this one. It is definitely the less complex build and has to be the underdog here, but I just really like the shape of Punisher. On a quick glance it’s tallneck, obviously. But looking closer, I have no freaking clue. Not only are the models fantastic, but they both capture the sense of movement splendidly. The majestic pace of the thallneck or the aggression of the prowler? Heck, I’ll come back to it, can’t decide right now. Going with Tallneck eventually, Punisher’s got too many showing studs in the front and that hose Ted mentioned stands out now, although I didn’t really noticed it before. Showing studs! Somebody think of the children! Damn, I forgot the parental guidance again. Oh, shucks. I can admire the artistry of the Tallneck for a long time but the almost organic malevolence of Max’s Punisher takes my vote. Punisher. Tallneck is brilliant and elegant, but for brute force and stamina my money’s on the turtle. I love those rear legs, the joint placement is absolutely perfect for something that looks like it’s ready to pounce. It sort of reminds me of the Geth Ghost from Mass Effect, coiled up, agile, and ready to put a world of hurt on you. The Longneck has some amazing qualities though, those feet are outstanding. The names are vital, Tallneck doesn’t instill much fear or dread whereas Punisher says it all. Tallneck is such magnificent creature. Went back and forth a bit on this, both are excellent, and for a while I was thinking the Tallneck’s long, spindly legs couldn’t actually stand up, but closer examination revealed a solid structure inside. On the other hand a closer look at the Punisher made me conclude that while it has some sweet lines and lovely joints, the front is severely underutilized and should really have gotten some more love. So my vote goes to the Tallneck. Welcome to the Manifesto Jens, glad to have your vote on the fights and I hope you stick around! That Tallneck (and Nicola’s other, stunning, Horizon creations) are among my top-most favorites of 2017. His Thunderjaw is a masterwork, and I’d slot the entire collection somewhere around Rowntree’s viper landing pad. I discovered Punisher some time ago and fell in love. It’s a gorgeously done example of smooth part integration forming flowing shapes. Tallneck is impressive in a different way, but going off looks alone I’ll be voting Punisher. Incidentally, this is a funny matchup. Feels like I’m comparing two different people, one of whom has been squashed flat, and the other stretched out. Punisher is a masterpiece all on it’s own, but the sheer scale and innovation of Tallneck, as well as the intricate details in the feet and wiring connections, have won me over. Tallneck it is! 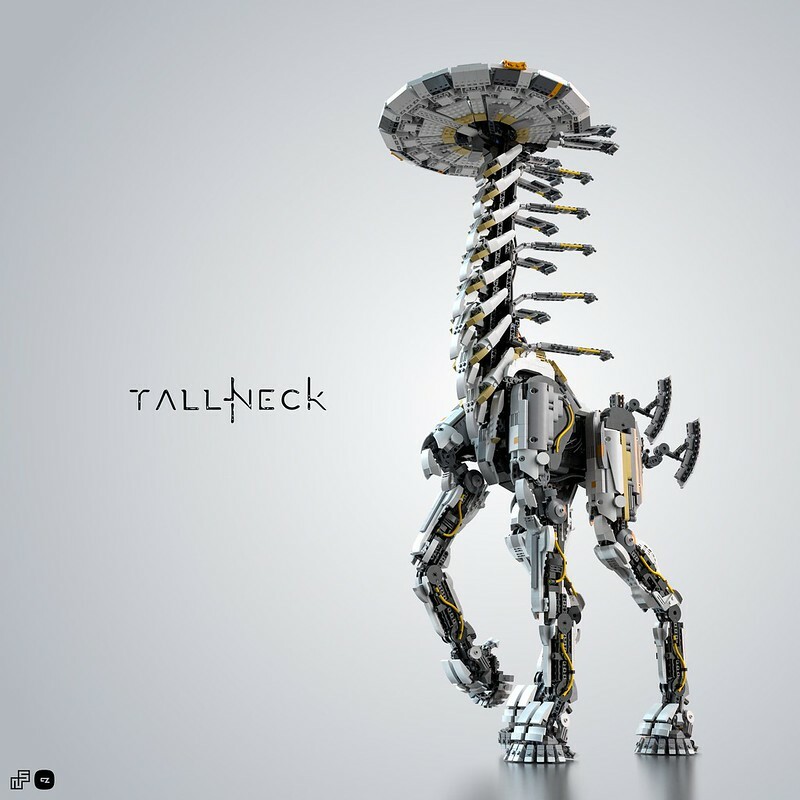 I have to go Tallneck, but I’m a bit biased, having examined the model pretty closely on Mecabricks. This is a tough decision. I really like the unusual turn of events and feature of complex, fabulous, organic models. And on that note, both models capture the essence of the creature they represent absolutely perfectly. That is incredible design work. I vote Tallneck. I really dig the color combos.